After a minor screw up tracking my bike down (FedEx said they were holding it at a warehouse when in fact it was delivered to the bikeshop near the airport), we checked into the Comfort Inn in Troutdale, just east of Portland. 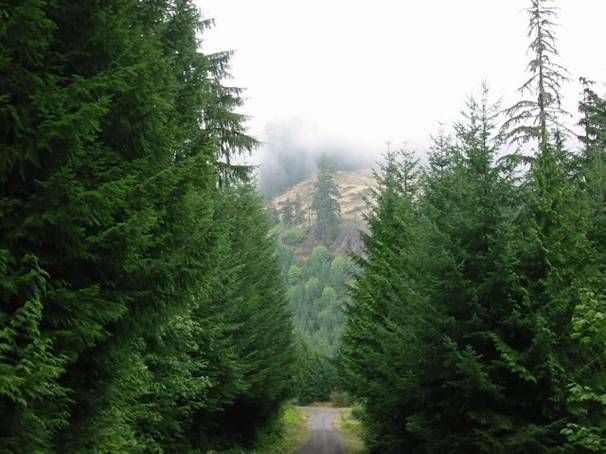 Troutdale is at the mouth of the Columbia River Gorge and the famous historic highway that runs through it. There was also a manufacturer’s outlet mall across the street. Cathy was all set to shop for a while, while I got a ride in. 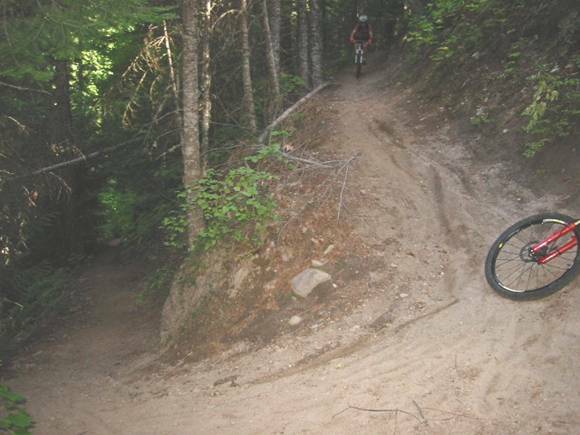 The intent was to bike from the hotel to the summit of Larch Mountain, a paved 4000 foot climb used in time-trials, then bike the singletrack up top. The climb was beautiful, near zero traffic. 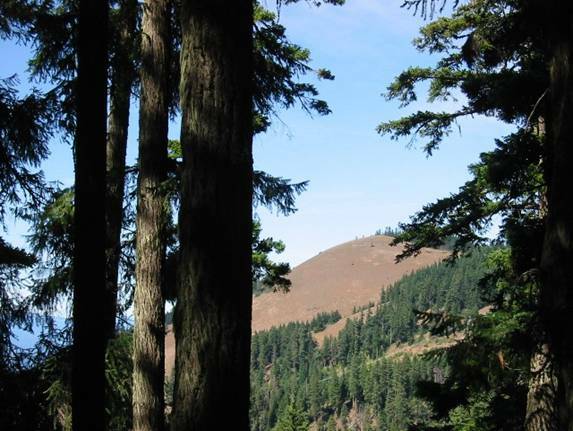 The hotel sits near sea level, and the summit of Larch Mtn is at 4056 feet. I did not anticipate how much cooler it is at 4000 feet. It was maybe 65-70 at the hotel, but cold enough to see your breath at 4000 feet. I later learned it can snow on Larch Mtn in June, and there are only 2-3 months where there is no snow up top. Due to a late start, I did not get to do the full MTB loop. Plus the trails were very soggy from a whole week of torrential rain just before we arrived. Only a couple miles of trail were explored. There were clouds in the area blocking the view up top. I had no idea of how spectacular this view was until I came back with Cathy a couple days later. The 24 mile, mostly monotonic descent was a blast, but I froze without any extra layers to put on. View from the Women’s Forum Lookout, approx. 700 feet above the Columbia River. This tree was at least 7 feet in diameter. Trees like this were everywhere I went. Saturday was to be a big biking day for me, a big shopping day for Cathy. Our plan was to do the coast on Sunday. I decided to do the Lewis River ride first in hopes that the heavy morning fog and cloud cover would burn off so views would open up for the afternoon Saint Helens ride. 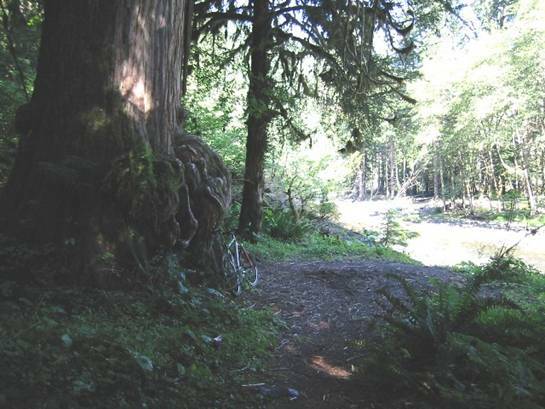 The Lewis River Trail follows the Lewis River in Washington, near Mount Saint Helens. This trail gets national attention in the magazines. 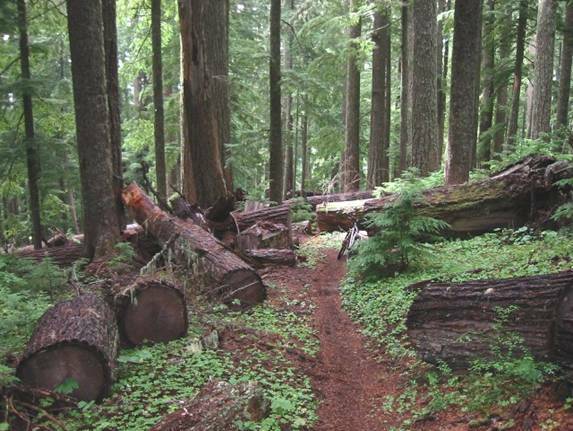 It is 100% singletrack through old growth forest, and the scenery is unbeatable. Plus the trail is really buff stuff. Think Return of the Jedi buff as you’re carving a smooth, narrow brown ribbon around unbelievably large trees. I rode the trail from the lower trailhead upstream to Lower Falls, and back. There were steep pitches along the way, and several scenic water crossings too. 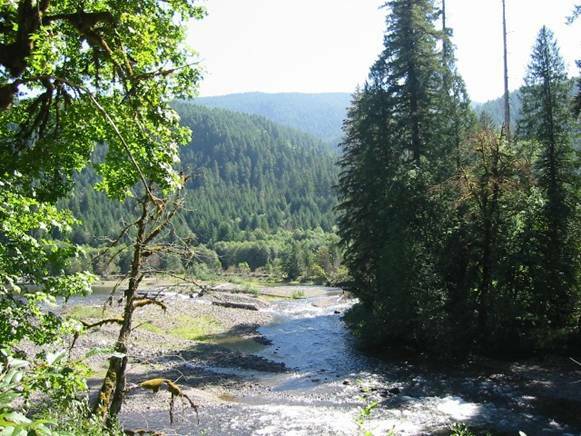 One of many vistas along the Lewis River. 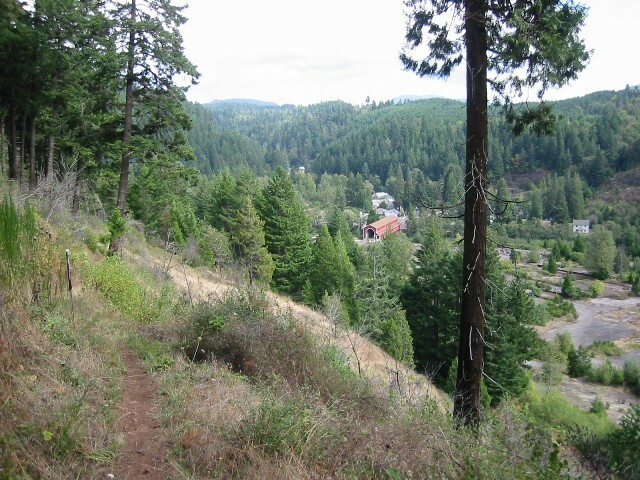 Much of the trail was bench cut into steep grades along the river. Here is a water crossing of a small stream feeding into the Lewis River. Just one specimen of old growth. The diameter of this one was probably around 8-10 feet at 8 feet above the ground. 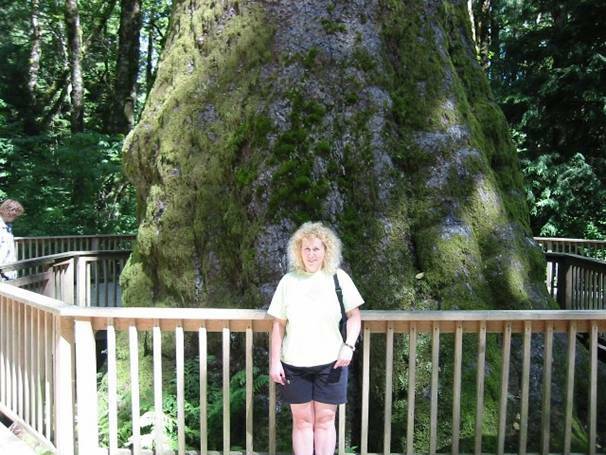 These trees are still 4 feet in diameter at 200 feet above the ground. Simply unbelievable. I’ve read they can be over 600 years old. 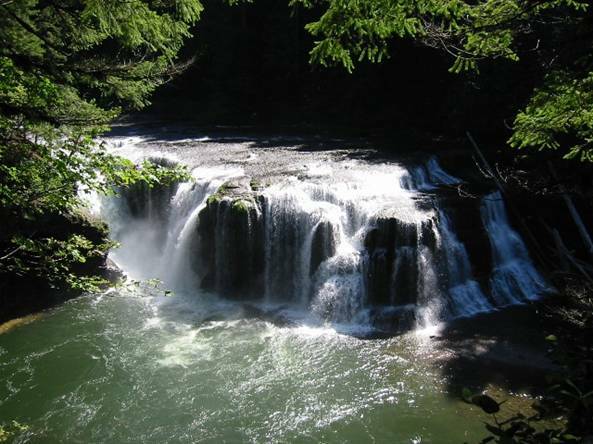 Lower Falls on the Lewis River. Vertical drop was maybe 60 feet. Dozens of sightseers here as parking is nearby. After finishing the out-and-back along the Lewis River, I zipped up to the Ape Canyon trailhead on Mt Saint Helens, less than an hour away. 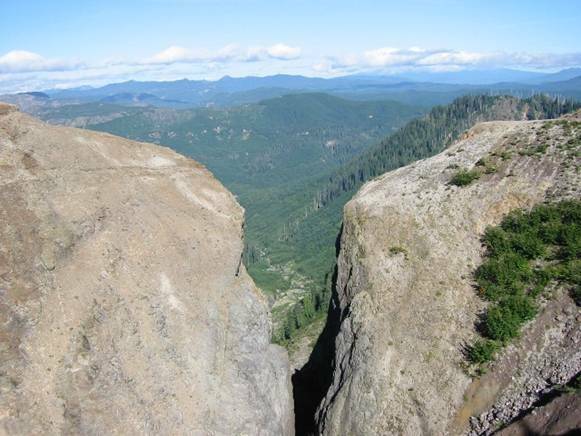 Ape Canyon Trail #234 gains about 1600 feet in 5.5 miles, where it meets up with Loowit Trail #216 above tree line. The trail is supremely buff, chocked full of old growth that somehow escaped the 1980 eruption blast, and switchbacks many times on the way up. I saw a lot of bikers on this one. 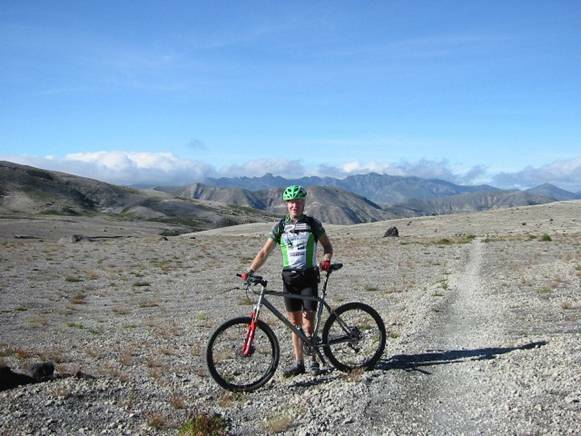 Once reaching Loowit Trail, the ride becomes much flatter through a surreal Mars-like landscape. This area is called the Plains of Abraham. There is very little vegetation here, just white pumice rock with a nice random distribution of large black boulders. Very tricky to ride on in places, like riding in 6” deep marbles. The Loowit Trail runs into the Truman Trail #207, which passes over Windy Ridge. This was one of the coolest things to ride across, if not a bit unnerving, as the pitch on both sides of the ridgeline was very steep. Maximum elevation reached on this ride was about 4700 feet. 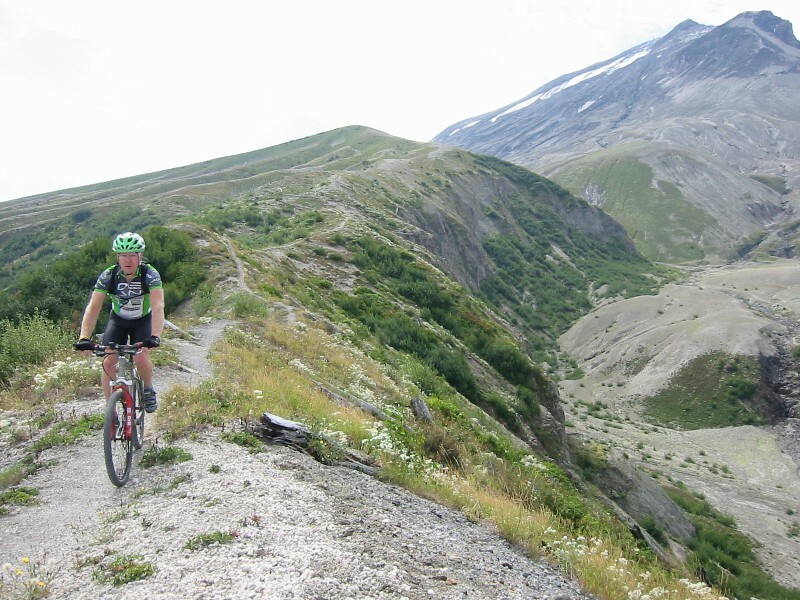 Bicycles are not allowed above 4800 feet, and in fact you even need a permit to hike above this elevation on Saint Helens. 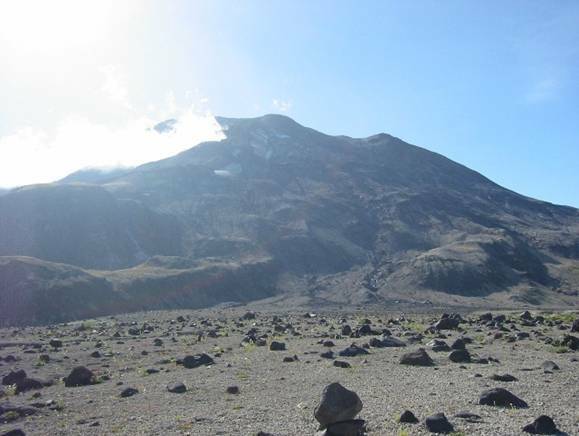 Only 100 hikers per day are allowed to the summit, and nobody is allowed in the crater. Riding Saint Helens was so satisfying I had to figure out a way to come back for another ride before flying back home. The Ape Canyon Trail and the Lahar Mud Flow in the background. Ape Canyon. 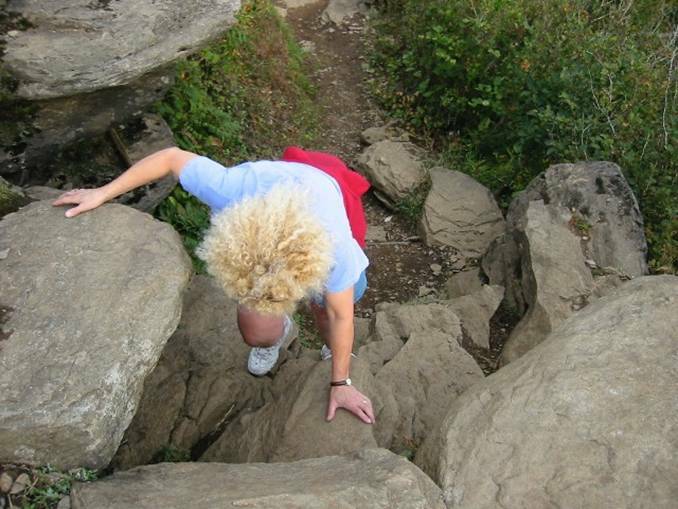 The trail where I was standing was very narrow and dropped vertically about 300 feet into the narrow crevice. A no-fall zone I walked on this ride. The snow-capped summit of Mt Adams (another volcano) just poking through the clouds. The Mars-like landscape around Mt Saint Helens. This is on the Plains of Abraham. Trail on the Plains of Abraham. You could rip 20+ mph on portions of this. Only problem was the views were so distracting. The Truman Trail along windy ridge. It really was windy here too. Thought for sure the strong cross wind would blow me over the east side of the ridgeline. This area was cleared of everything during the 1980 eruption. 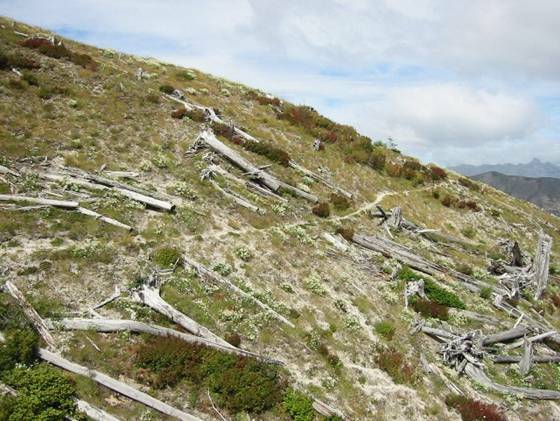 All the trees blown down point the same way – away from the volcano. There is parking at this trailhead, and I got the impression that a lot of folks shuttle this ride, riding Ape Canyon down only. By road it is an hour plus between trail heads. We had planned to spend most of this day together visiting the coastal area. 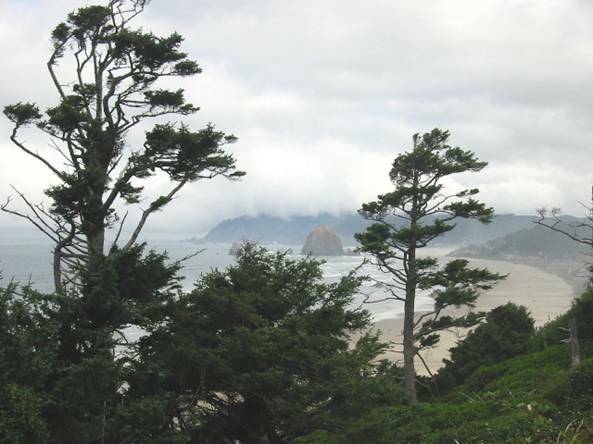 We drove out to Seaside, OR with the intention of hiking and riding on Tillamook Head, a 1000ft cliff shoreline. The problem was the overlook was buried in fog. Clear and sunny everywhere else though. The sign also said no bikes allowed, and I really wanted to sample some cliff-hugging singletrack. So with no view and no bikes allowed, we headed south along the coast. We stopped at Ecola State Park – no bikes. 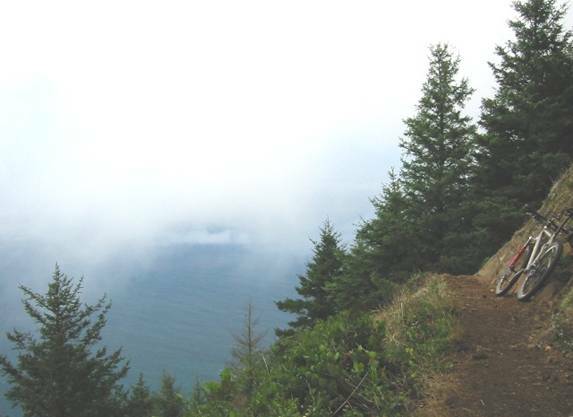 Oswald West state park – no bikes. However, the drive along coastal Rt 101 offered spectacular views. Pretty much anything above 1000 feet was socked in with fog. Finally we see a trailhead sign that headed inland from the coast. There was no additional info. Looked like fair game. There was a mountain peak there with a communication tower on it. There was both a hiking trail and a service road that both looked like they went to the top. Cathy chose to hike while I biked up with the intention of a summit rendezvous. The service road was unbelievably steep in spots. 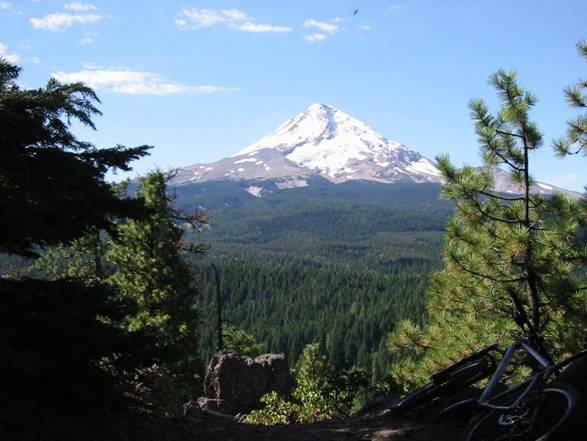 I later learned after buying an Oregon MTB guide book what this mountain was called and that it gains over 1200 feet in about 2 miles, for an average grade of 12%. Cathy and I did meet up near the summit after I did a little exploring around up there. The view was spectacular, in and out of the clouds whizzing by. I decided to take the singletrack down, which was mostly buff, with a zillion switchbacks in it, and several root outcroppings. It was all bench cut into the steep mountain side. A short ride, but I got my fix for the day in. A very lucky find. Tillamook Head socked in with clouds. Famous Haystack Rock just off Cannon Beach in center. 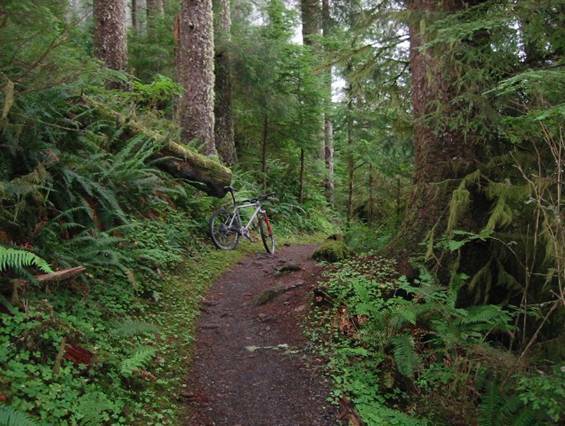 Singletrack on the back side of Neahkahnie Mtn. The area here was very lush and full of old growth trees. The ocean side of Neahkahnie. Very narrow benchcut singletrack with the Pacific Ocean 1600 feet below. 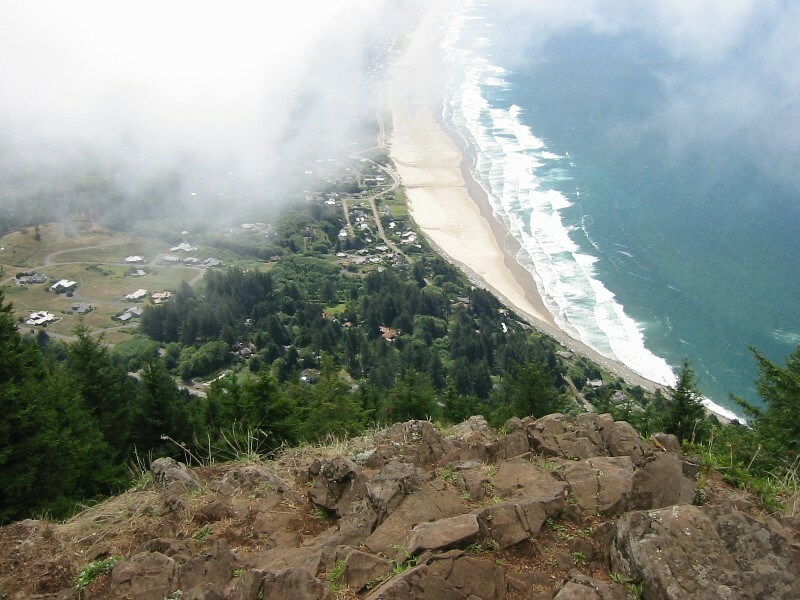 Manzanita Beach 1600 feet below the summit of Neahkahnie Mtn. It is more down than out. It’s hard to believe a trail can be cut down the front side of this mountain. Had to wait for just the right instant to snap this picture, as the clouds were whipping by and views were fleeting glimpses. On the way back to Portland, we saw a sign for the largest Sitka Spruce in North America. We had some time, and it was right off the highway, so we checked it out. Not particularly tall, but it sure was big at the bottom. Stayed fat all the way up too, with a kind of spindly top. Since we had a couple hours of daylight left and the skies were crystal clear to the east, I wanted to take Cathy to Larch Mountain to see the view. It’s less than a 40 minute drive from the hotel. We parked in the summit parking lot then hiked the quarter mile to Sherard Point, a rocky outcropping with a 360 degree view of many great volcanoes, including St. Helens, Rainier, Adams, Hood, and Jefferson. I brought the tripod with the hopes of capturing a multi-exposure panoramic photo. Cathy and I were both totally amazed at the view. There were other serious photographers up there too. After taking a bunch of pictures, I went for what I thought would be a quick sub-30 minute loop around the summit while Cathy hiked one of the trails. The trail descended way more than I anticipated, and it was unbelievably rocky and washed out. I had to climb 1200 feet back to the summit in quickly diminishing light. Cathy and I both were worried I wouldn’t make it before sundown. Even in full sunlight these forests are dark. At sundown, you can hardly see. I made it back with very little margin. I surprised myself in what I was riding over. Loosing light gives you a good incentive to hurry. Glad I didn’t crash, but my legs were toast and we had a 100+ mile tandem ride planned for the next day. Mount Hood, about 22 miles away. A break in the clouds was nicely illuminating the summit. The two of us with Mt Hood in background. 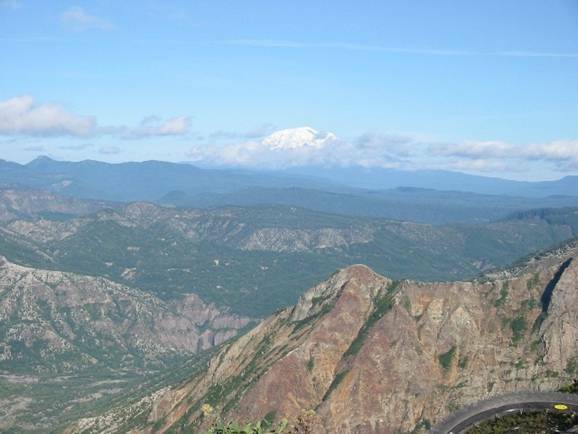 Mount Saint Helens from Larch Mtn. Before 1980, it was 1300 feet taller with a pointy top. It blew its top during the famous 1980 eruption. 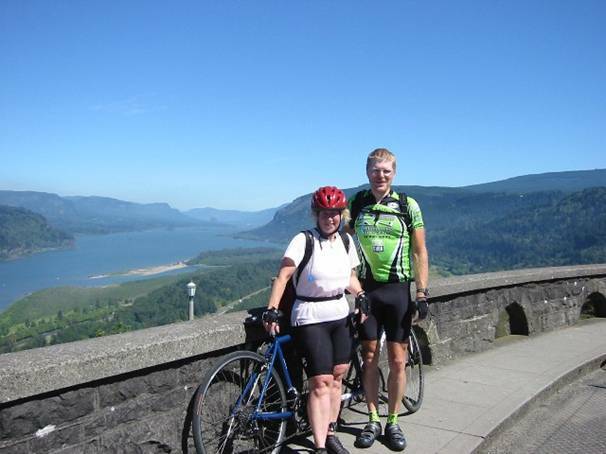 Riding the Historic Columbia River Highway on a rented tandem was to be our capstone ride. Sunday afternoon between visiting the coast and Larch Mtn, we picked up the tandem rental so we could embark on a 100+ mile ride first thing Monday. It was quite cold when we left, shortly after 8am I think. Was supposed to be a beautiful day. The first few miles are fairly flat, then we hit a 700 ft climb to the Women’s Forum Lookout. Very modest grade however, probably not exceeding 5%, and much less most of the time. The descent from Crown Point was incredibly fun. Many miles of swoopy switchbacks. This portion of the historic highway had very little traffic. After the descent, we’re back to sea level and hit waterfall row. Just one amazing waterfall after another. 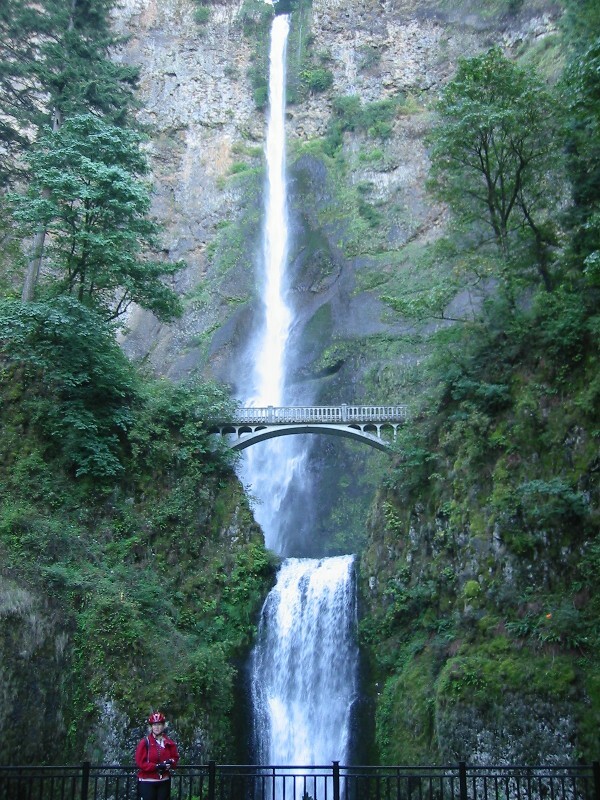 The most famous, Multnomah Falls, drops over 500 feet. With a week of heavy rain just before we got there, everything was flowing very strong. We stopped at each fall for pictures, skipping Oneonta Gorge for on the way back. We soon ran out of historic highway and bike path, so we had to pop out on the nasty busy Interstate 84. This was chocked full of 70mph double and triple bottom semi rigs. Even though the shoulder was wide and signs were up making motorists aware of bikes on the interstate, these two miles were extremely unnerving. After this bit, we get back on bike path which terminates at the town of Cascade Locks. We were now about 35 miles out, and the next points of interest were more than 10 miles away, which meant a 10 mile stretch of interstate before picking up bike path again. We decided against it. This ride wasn’t turning out nearly as romantic as the online info made it out to be. The first 22 miles were very nice. So we headed back, knowing we’ll only log about 70 miles for the ride. But we stop at the Oneonta Gorge. We really didn’t know what this was. We knew you could hike into it and there was a waterfall back in there somewhere. This turned out to be about a 1 hour endeavor. First there’s this huge log jam to scale, hundreds of old growth logs piled 20 feet deep. Very treacherous in cleated cycling shoes as everything was slimy. 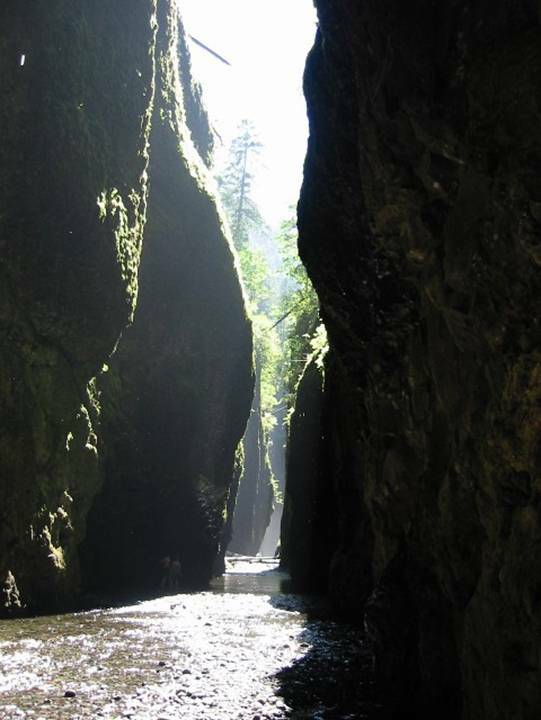 The gorge gets very narrow and deep as we progress, hundreds of feet deep and only a few feet wide in places. Then there’s the deep water part. Chest deep in ice, and I mean wicked cold water. Take your breath away cold. Finally we reach the falls at the end of the gorge, maybe a 200-300 footer. While we were hanging out at the falls, a cascade of fist sized rocks came down. One smacked Cathy in the hand hard, causing her hand to swell up. We still had our helmets on as I didn’t want to leave them unattended at the bike. We may have well needed them. We finished the ride early and were able to return the tandem yet that day. We both thoroughly enjoyed the ride, probably the most adventurous thing we did with the hike into Oneonta Gorge. Cathy was completely wiped out from the ride. It was way more climbing than both of us thought. I had a little left in my legs, and while Cathy recovered at the hotel, I drove over to a small nearby Portland park that allowed mountain biking. 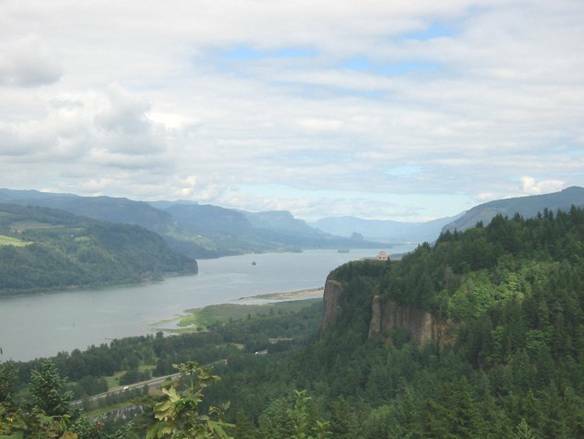 From Crown Point on the Historic Columbia River Highway. Interstate I-80 can just be seen behind Cathy 700 feet below. 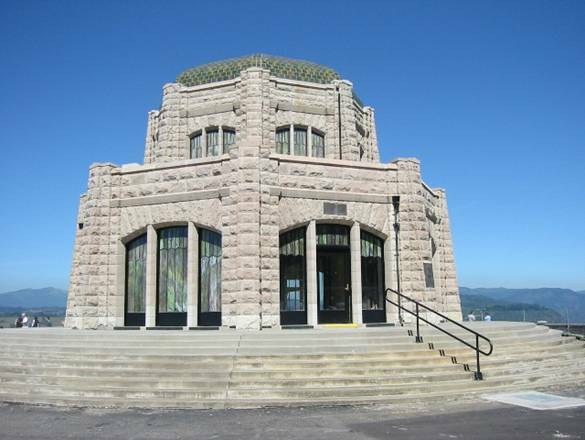 Crown Point Vista House. It’s being renovated, so we couldn’t go inside. 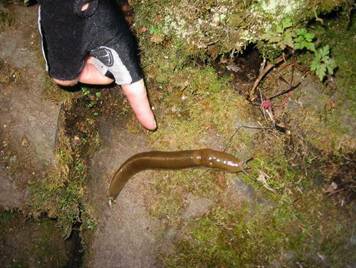 These slugs were everywhere, some as big as ballpark franks! 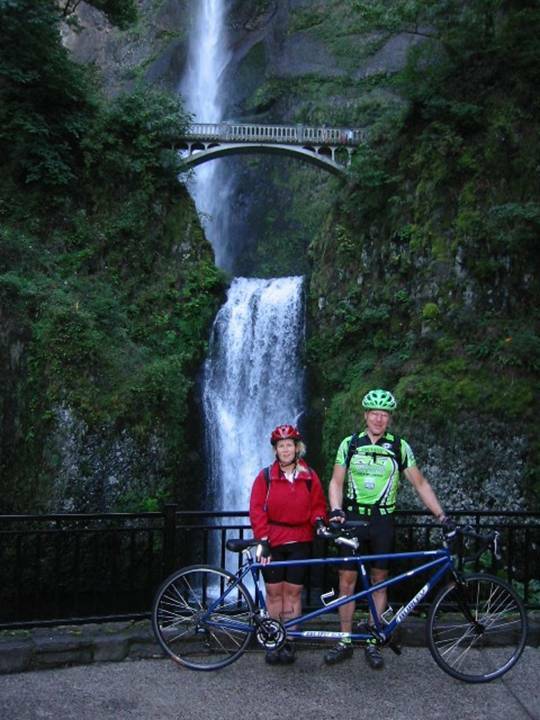 The two of us with the Burley Rumba tandem at Multnomah Falls. 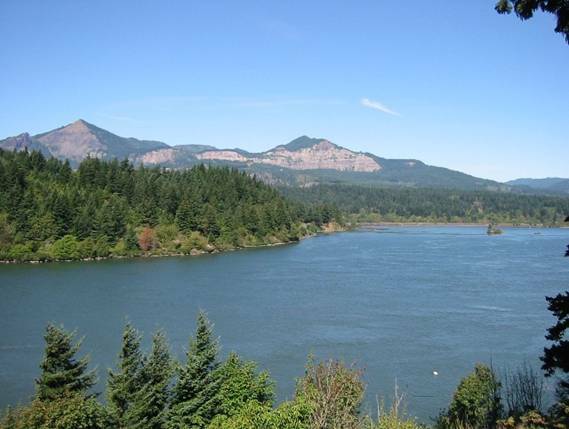 View across the Columbia from the town of Cascade Locks. 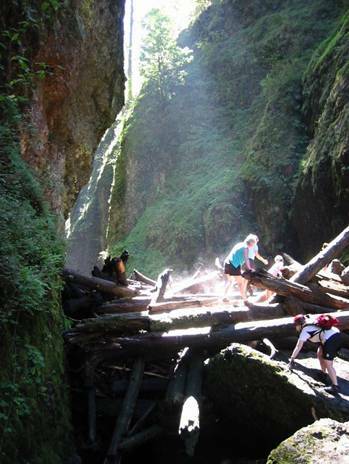 Cathy (in pink) negotiating the log jam in Oneonta Gorge. 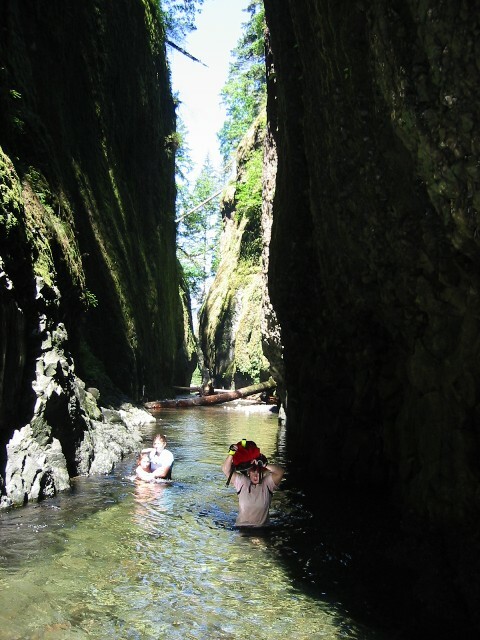 Cathy wading the deep section in Oneonta Gorge. You can almost feel how cold the water is by looking at Cathy shiver. 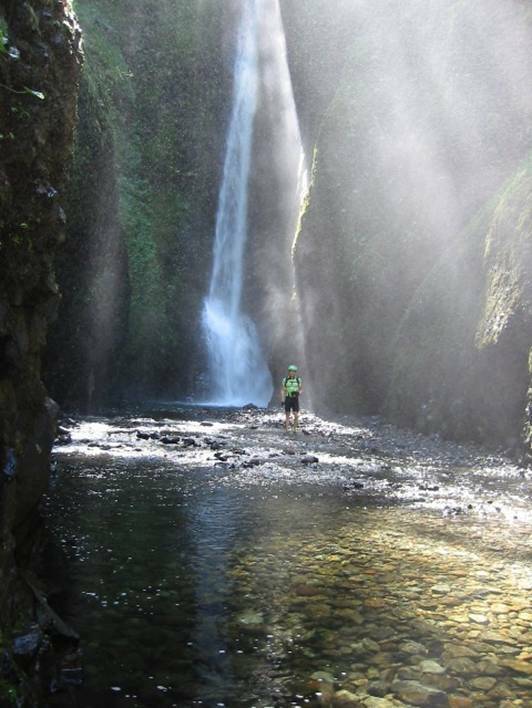 Oneonta Gorge, looking inward toward the falls. You could here it, but not see it. 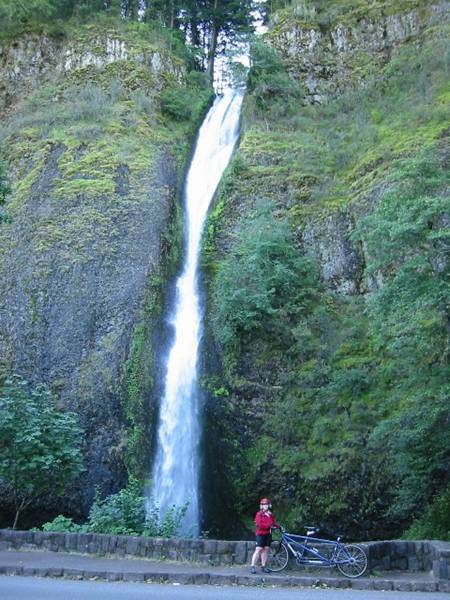 Finally, we reach Oneonta Falls at the end of the gorge. It was extremely difficult walking on those rocks in cycling shoes. 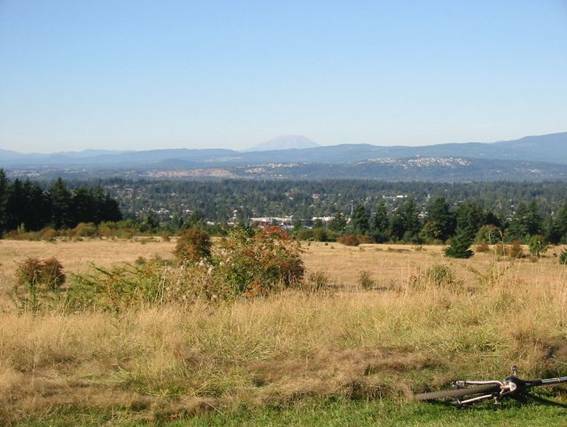 Powell Butte is an urban park that has a few singletrack trails open to mountain biking. The summit, over 600 feet above sea level, is open and grassy and offers spectacular views of Mt Hood and Mt Saint Helens. I went out to get a Starbucks after our long tandem ride while Cathy rested back at the hotel. This place was just a few miles further down the road from Starbucks. 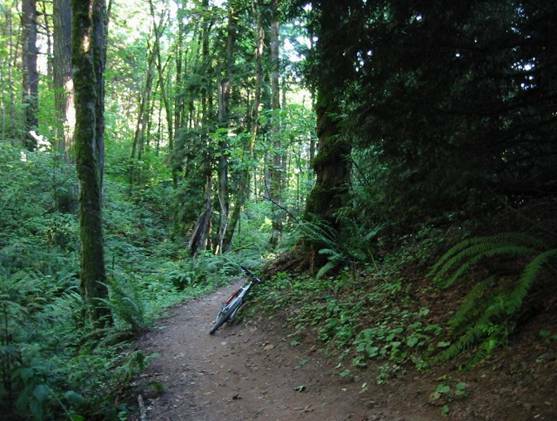 I went up the front side on doubletrack, down the back side on sweet singletrack, then rode several miles on the popular paved Springwater bike path. Then I pretty much backtracked to the car, doing a loop up top first. Mt Saint Helens from Powell Butte. It must have been really scary for Portland residents (in foreground) to see this thing blow its top in 1980. Mt Hood from Powell Butte. 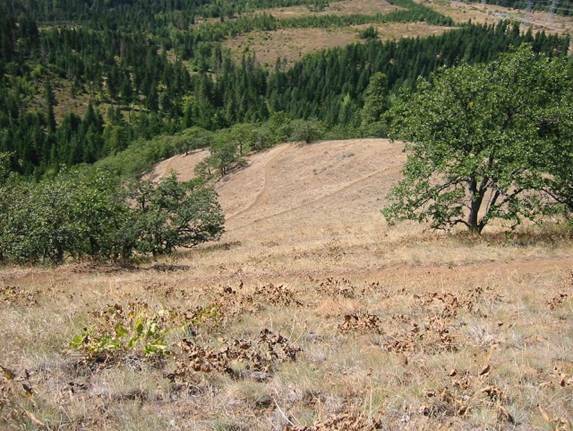 Markers on Powell Butte indicating direction, distance, and elevation of every significant peak that can be seen from this butte. 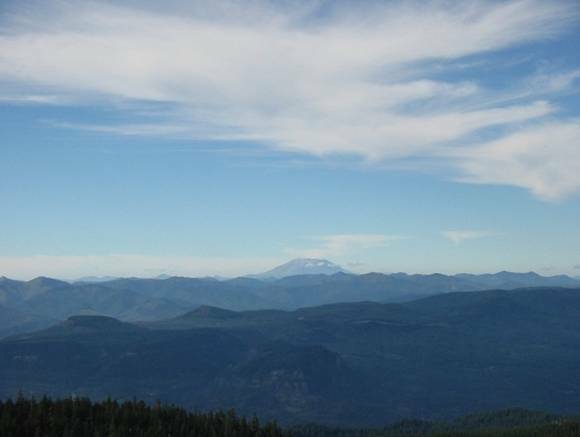 Shown here are Larch Mountain (4065 feet at 19.7 miles on left, and Mt Hood (11,235 feet at 39.4 miles on right). 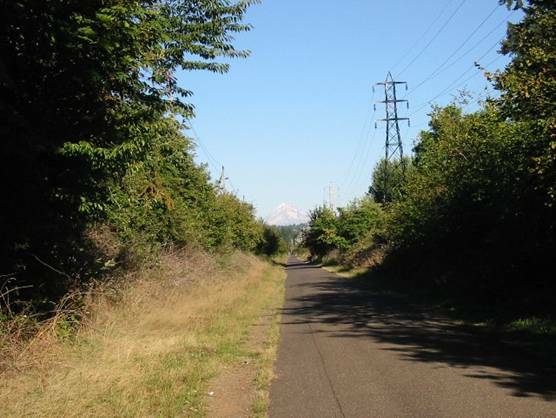 The Springwater Corridor bike path. Notice Mt Hood on the horizon. The Pioneer Orchard Trail on the south side of Powell Butte. Coming down this buff singletrack was like being on rollercoaster rails. Had planned to drive out to Crator Lake today. 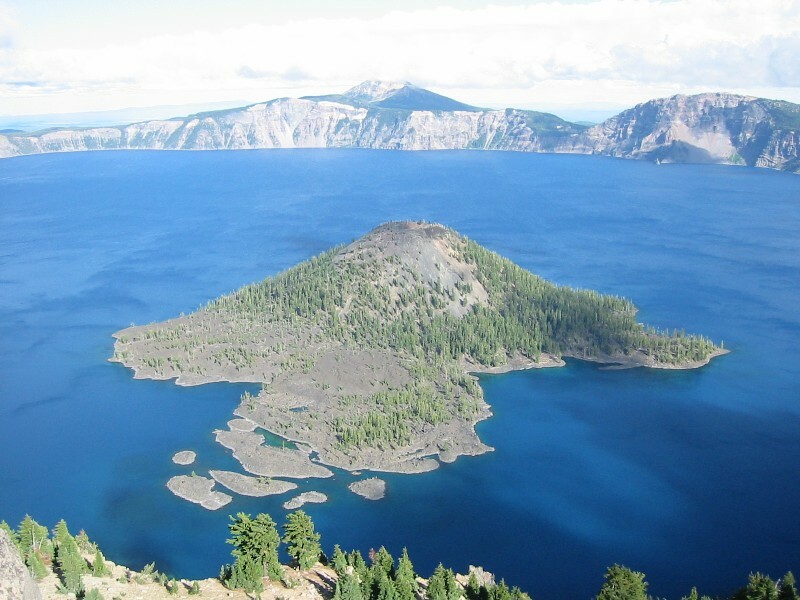 But, rain was moving into Portland Wednesday and Thursday, so we decided to push back Crater Lake one day since it is behind the coastal mountains and stays dryer. So Thursday’s activities got moved up to Tuesday. After driving a little over an hour out to the Hood River Valley ranger station to learn about conditions and pick up more detailed maps, Cathy and I decided what to do. 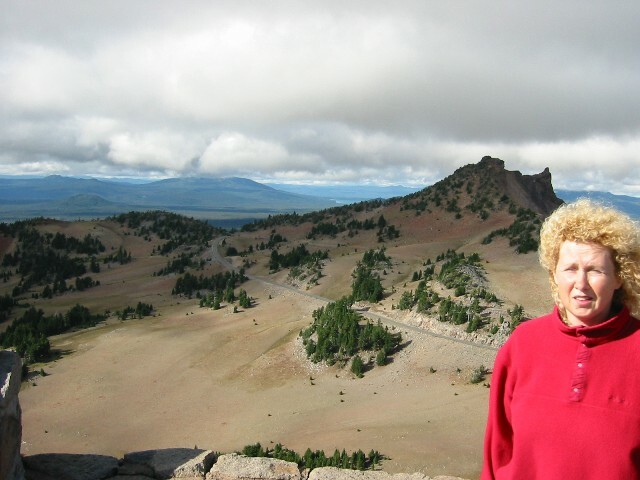 She would hike up a direct route to Bald Butte, which is almost across the street from the ranger station. 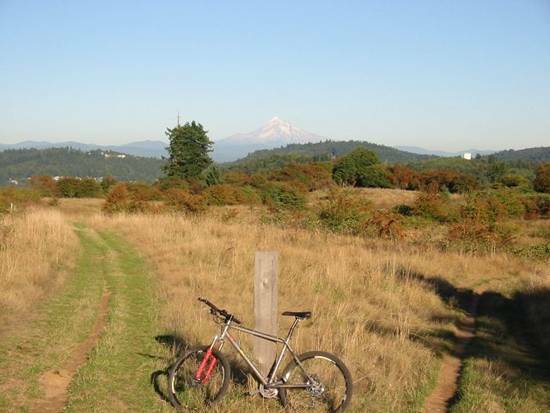 I would bike several miles south on Rt 35 and pick up the Dog River Trail, climbing to Surveyors Ridge, then head back north to Powell Butte for a potential rendezvous. 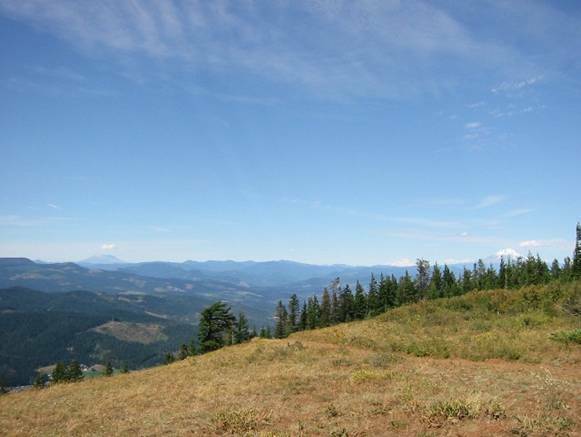 Surveyors Ridge is opposite the Hood River from Mount Hood, offering spectacular views of Mt Hood across the valley. So we each head off. The highway was a steady climb, maybe only 2% grade. Then I pick up Dog River Trail, where a guided group was just finishing a ride – several 40-something year old women coming down on dualies! The guy in the group was walking his bike out – a stick shredded the sidewall of his tire. This climb was persistently steep with some impossible (for me) to negotiate switchbacks. Pure buff singletrack though. After reaching what I thought was the top, the trail begins descending. And descending, and descending. I thought I made a wrong turn. There were unmarked trail junctions out there. But eventually I run into Surveyors Ridge Trail and begin making up a ton of lost vertical. I finally figured out where I am on the map when I reach the logging road at the top. Surveyors Ridge from south to north is wicked fun. Has a nice downhill bias to it, but still a lot of climbs along the way. I then met a couple on full suspension mountain bikes and loaded panniers going the opposite way. They must have been in their 60’s. Just to get to where they were was impressive. I was humbled. The views of Mt Hood and the valley below were frequent and very distracting. You just had to keep stopping and look. Eventually, much later than planned, I reach the junction of the trail Cathy came up to take to Bald Butte, a 2 mile out and back. I wasn’t sure if she came back down yet or not, so I rode out to Bald Butte. The last mile or so of this had some nasty loose rock hike-a-bike sections, but the view was worth it. In one shot, I could get Helens, Rainier, and Adams. Then the other direction was Hood. Just awesome. I had to hike-a-bike down this thing too, it was so scary. Then I pick up Oak Ridge Trail, the one Cathy hiked. Starts our really nice. But then it becomes so steep with at least forty 180-degree switchbacks on loose rocks. I was unable to negotiate several of them. Cathy was back to the car when I got there and could not believe I would attempt to ride down something like that. The whole ride was truly an epic. 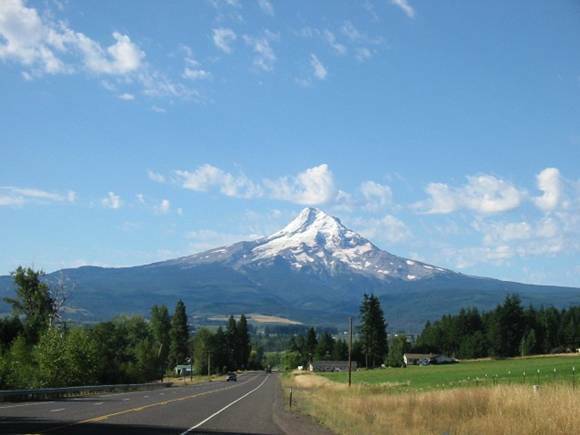 Mt Hood from Rt 35 Highway. One of many switchbacks climbing the Dog River Trail. I didn’t know a rider was coming down when I snapped this photo and she scared the crap out of me. Surveyors Ridge Trail. Views were abundant from this trail, reaching 4280’ elevation. 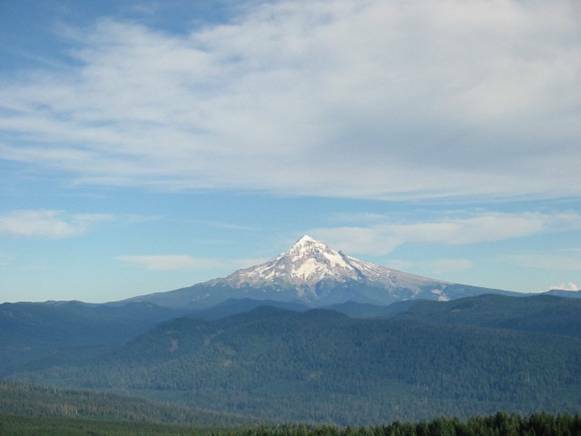 One of many views of Mount Hood from Surveyors Ridge. 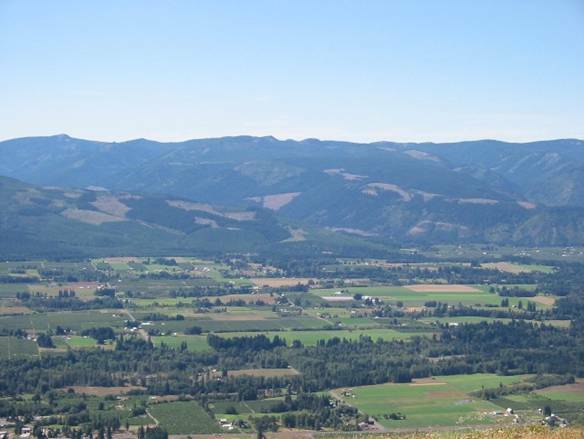 The Hood River Valley from Bald Butte. Mt Saint Helens, Mt Rainier, and Mt Adams from Bald Butte. 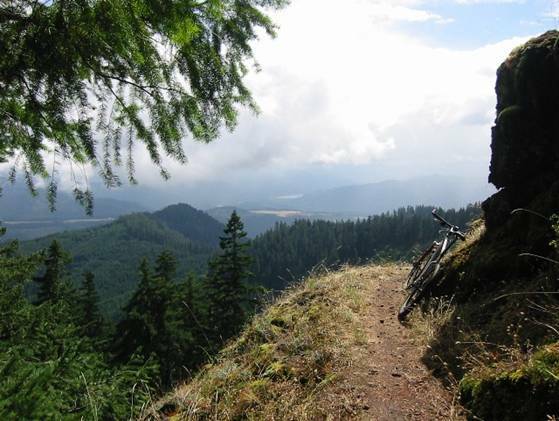 Bald Butte from top of Oak Ridge Trail. Oak Ridge Trail switchbacks. Very steep and very loose. 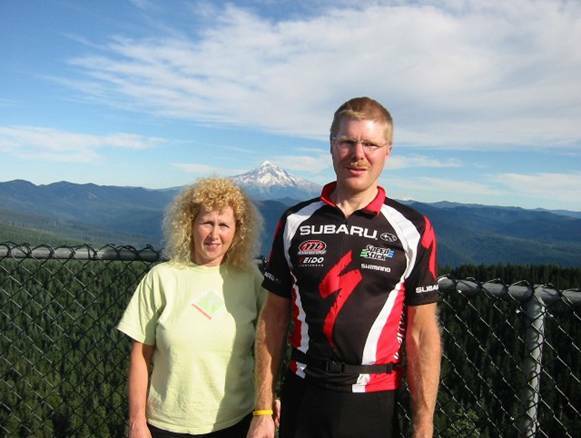 Tuesday evening, after finishing our Mt Hood area visit, Cathy and I headed over to Eugene, OR. We stayed two nights there. 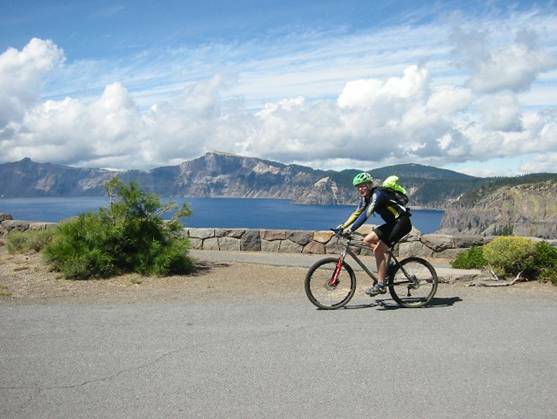 It divides the 5 hour drive from Portland to Crater Lake in half, plus it’s close to another great trail riding location. Today we head off early to Crater Lake. It’s raining in Portland by now, and it was raining through the Cascades en route to Crater Lake. But after we crest 5000 feet, the skies clear up. The weather was quite good once we got to the national park. Partly sunny, windy, and chilly. The drive out to Crater Lake is fairly desolate, just scrubby pines, sandy, semi-arid environment. Quite high elevation too, maybe hovering above 5000 feet. 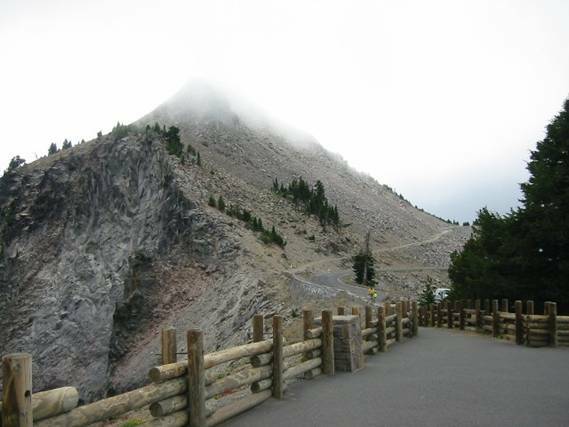 We pay the entrance fee at the north gate and begin the drive up to the rim. Cresting the rim and having the view of the crater open up just takes your breath away. We park right there and walk up to the edge for pictures and to soak up the view. 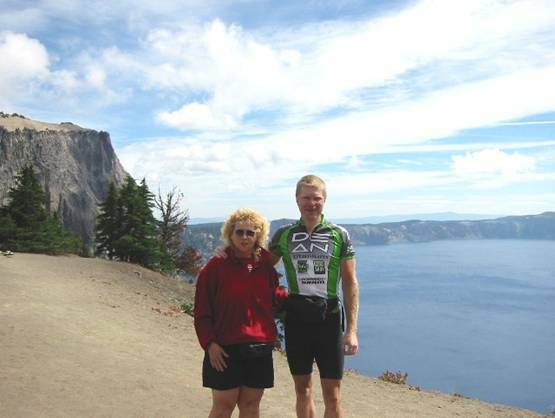 I really wanted to bike all the way around Crater Lake on Rim Drive, so Cathy and I decided she would shadow me with the car half way around (by driving ahead to the next vista and wait for me). The she would do a hike up Mt Scott while I “suffered” through the climbing part of the loop, meeting again where we first parked. The loop is incredible, offering many vistas that ranged from about 6000 to 8000 feet above sea level. There were three significant climbs, ranging from 600 to 1200 feet, plus numerous smaller climbs. All paved. Bikes are not allowed on side trails. After Cathy hiked, we crossed paths again about 5 miles before my ride ended. After packing the bike back up, we decided to do a short hike together to the peak called The Watchman, an active fire lookout. The total hike was about 1.6 miles and climbed 663 feet to an elevation of 8,013 feet. 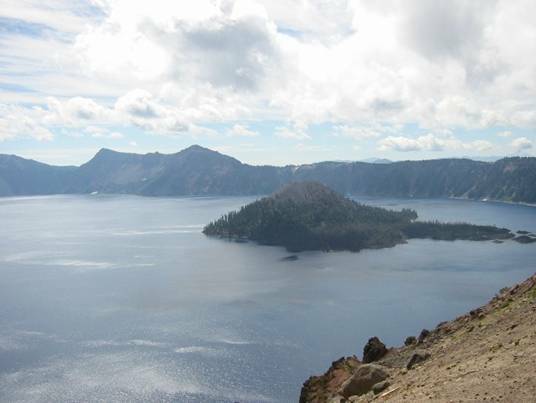 The birds-eye view of Crater Lake was stunning from this vantage point. I could really feel the elevation on this ride, averaging above 7000 feet elevation. The 5% grades felt like 10%. Initial view from north entrance. Different angle of initial view. Vista point on east side of Crater Lake. 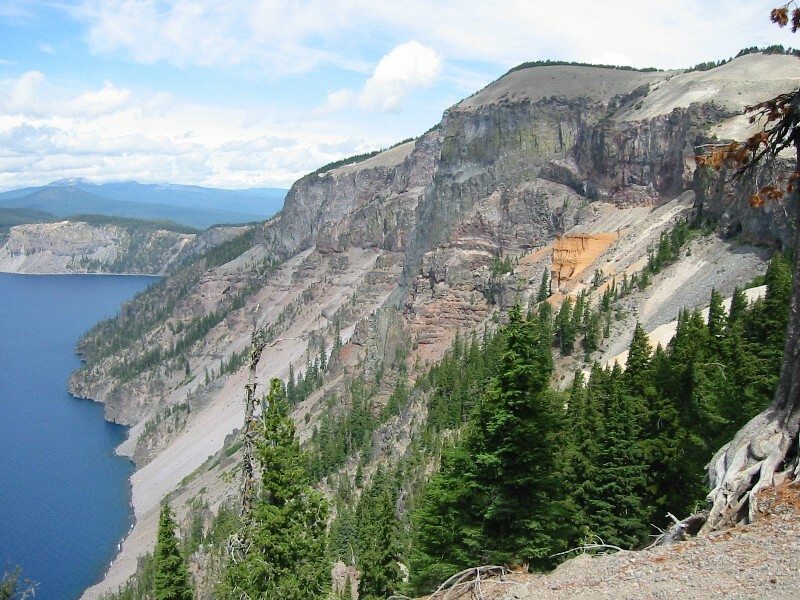 Vista along southeast side of Crater Lake. Cloudtop Overlook in upper right was the high point of the ride, at 7960 feet. The Watchman peak with foot path leading to summit. We hiked this, and it was extremely windy and cold up top, intermittently in and out of clouds. Cathy heading back down The Watchman. View of Crater Lake from The Watchman at 8013 feet elevation. The bluest parts are where the sun illuminates the water. Mt Scott, where Cathy hiked, is in center background. This is the deepest lake in the world at nearly 2000 feet. View to the north from The Watchman. Rim Drive also shown. It was still raining in Portland and threatening to rain in Eugene where we were staying. The plan for today was I would drop Cathy off at the nearby mall and I would ride while she shopped. Cathy is into shopping as much as I’m into mountain biking. After dropping Cathy off, I headed over to the village of Westfir, location of the famous annual Cream Puff 100 mountain bike race. It is anything but a “Cream Puff.” The race does three 33 mile laps, each with about 6000 feet of climbing. 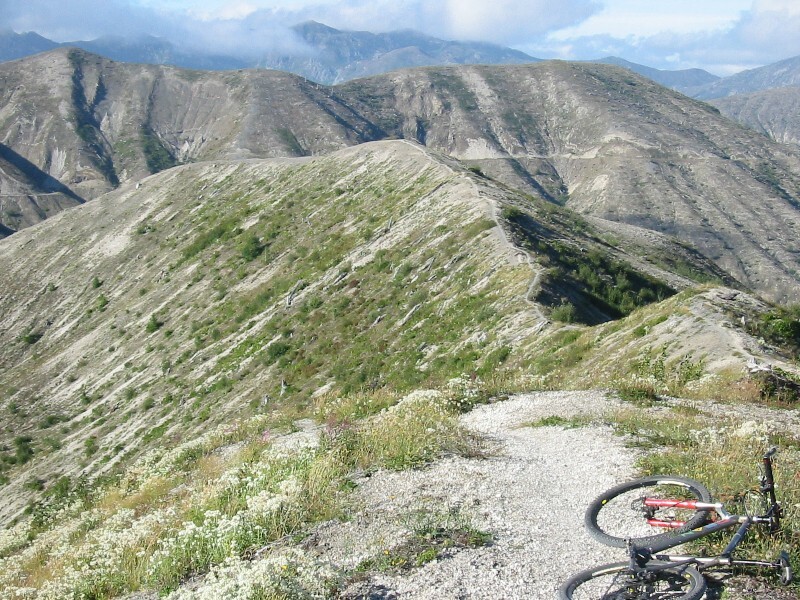 That’s 100 miles and 18,000 feet of climbing, and it’s touted as the toughest 100 mile MTB race in the world. After stopping at the ranger station just a mile from the trailhead to pick up a good map (a lifesaver! ), I park at the famous covered bridge in Westfir. It briefly poured out while driving to the trailhead, and I was becoming very bummed. Plus, it was very cold here and I only had a long shell along, no thermal layers. My plan was to follow the Cream Puff 100 course. The climb, 17 miles long and gaining 3600 feet, begins on 3 miles of pavement, then 14 miles of forest service roads in good shape. Not steep at all, with one significant downhill on the way up. In fact, single-speeders place in the top five on this course. The roads were poorly marked up top. I was in the clouds, it started raining again, and I was freezing. Couldn’t feel my feet or fingers, and my bare knees ached. I went purely by intuition a couple of times on which turns to take or ignore. 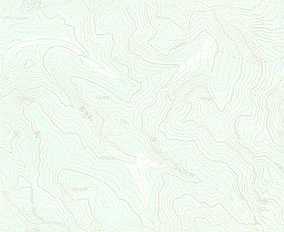 Even though I had a good topo map, the unmarked road junctions and dense fog precluded reading the terrain or gaining a sense of direction. I did eventually find the Alpine Trail trailhead without taking any wrong turns. 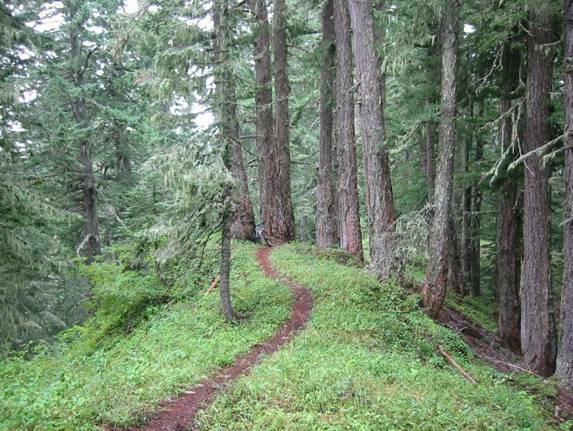 It nearly stopped raining at this point, and the trail looked to be a very narrow, smooth, brown ribbon of singletrack. 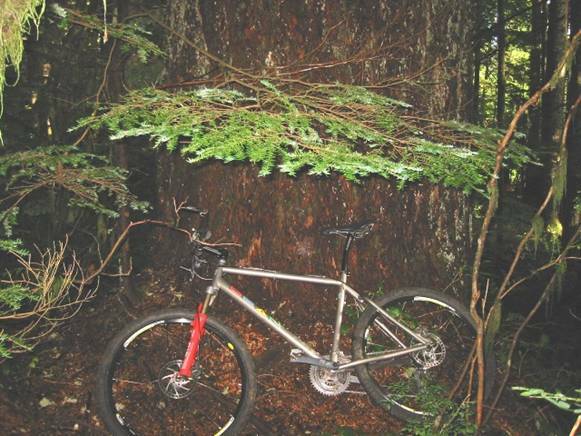 It first climbs a couple hundred feet over a small peak through magnificent old growth forest before descending a little. Then a more aggressive several hundred foot climb ensues to the summit of Sourgrass Mountain. The mountain is covered in a unique grass, presumably sourgrass, but no view due to cloud cover. 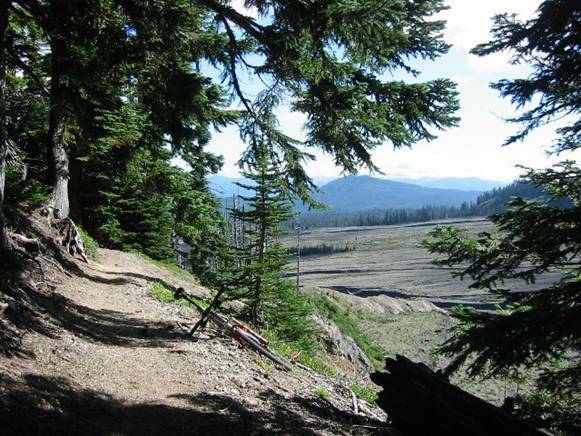 The trail then rolls up and down around 4000 feet elevation for several miles. Wicked fun stuff. Finally the descent begins in earnest, at times very steep with switchbacks. When I think I must be about to the bottom, another view opens up, now on the sunny side of the mountain, and I’m still way above Westfir. Some more rolling benchcut singletrack is followed before steep descending resumes. Portions of the final descent were extremely fast and smooth. Couldn’t help but wear ear to ear grin coming down this stuff. Finally the covered bridge in Westfir pops into view and I knew the ride was about over. I finished the ride in partly sunny skies, but I no more than started heading back with the car when I ran into torrential downpours. Really lucked out. I encountered only 30 minutes of light rain in a 3.5 hour epic ride. Cleaned up and changed in the new trailhead facilities. Made it back to the mall to pick Cathy up almost right on schedule. Feasted at Hometown Buffet at the Mall. Had to pretty much eat until I was stuffed twice a day to maintain this much activity. The hotels had decent breakfast buffets, and we hit a variety of places for dinner, from Taco Bells to buffets to Shari’s (like a supper Denny’s) to a nice Mexican restaurant in Troutdale. The road up to Alpine Trail. Approaching cloud line. 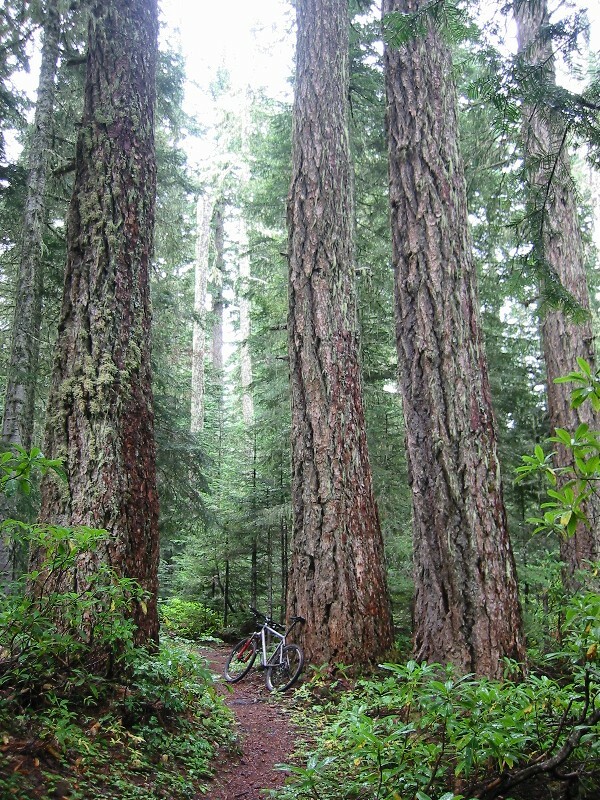 Old growth forest on Alpine Trail. Just couldn’t get over how big trees can get. 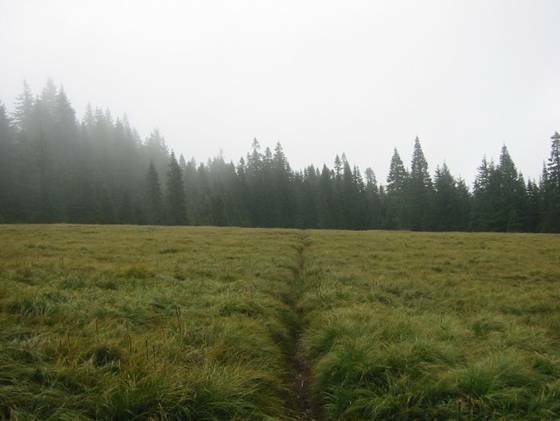 Much of Alpine Trail follows a spline down Sourgrass Mountain. Non-technical, totally peaceful descent. Never saw another person on the trail. Blowdowns on Alpine Trail. You wouldn’t be able to bunny hop these big boys! Some were so big you had to reach up to touch top side of log. Summit area of Sourgrass Mountain. The grass was deep and wet. It hung over the trail which contained hidden large embedded rocks. Dry side of the descent. There were some very steep drop-off areas, but not quite fear of death kind of stuff. Self portrait. Got good at setting the camera up for delayed shots. Had ten seconds to run to my bike, hop on, clip in, and look like I was just riding along. Had just shed yellow shell prior to taking this shot, as the sunny side of the mountain was much more pleasant than the see-your-breath rainy side. Red covered bride in center, car parked just other side. 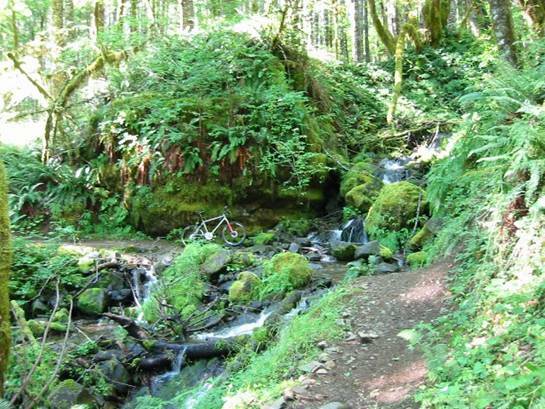 Middle Fork of the Willamette River visible on right, singletrack on left. Just had to come back here again on an even nicer day with Cathy. 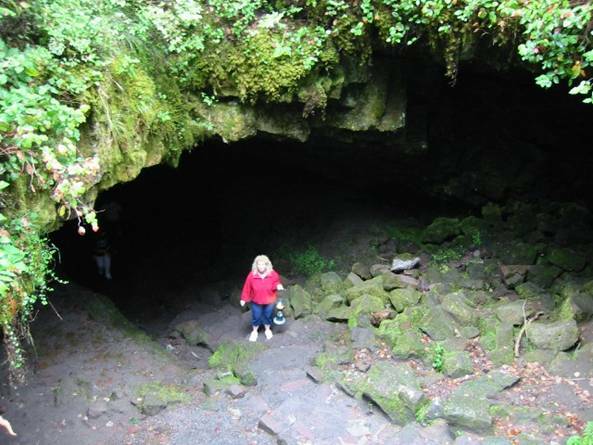 Cathy was very apprehensive about visiting a volcano that recent blew its top, especially when our plans for the day included a hike into Ape Cave, an ancient lava tube deep into Mt Saint Helens. There was heavy overcast driving out to St. Helens. We decide to do the cave first. I wore my LED headlamp, and we rented a gas lantern (two sources of light are required for entry. The cave entrance looks very scary, descending vertically first on stairs. Once inside the lava tube, it descends gently. It’s also very cold, supposedly 42 degrees year round. Very eerie walking inside this thing. The ceiling on this portion was 10-20 feet high, and the cave sidewalls have unique scouring marks presumably left by lava flowing through the tube. I wanted to shut the lights off once deep inside, but Cathy would have nothing to do with it. Maybe a quarter of a mile in or so, we decided to turn back. The tube is 2.4 miles long. After visiting Ape Cave, we drive a few minutes over to the Ape Canyon trailhead. 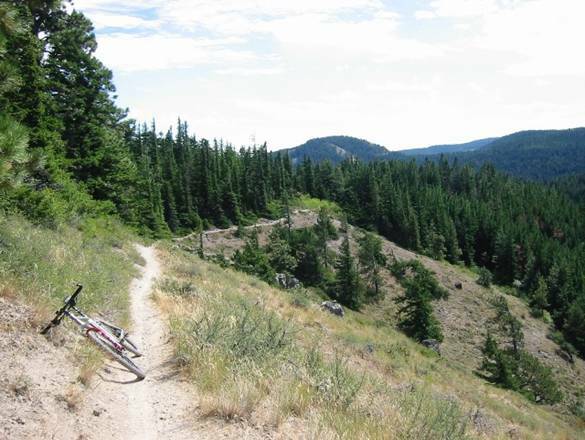 Cathy was going to hike to the tree line, while I biked the same route as 6 days earlier out to Windy Ridge and back. 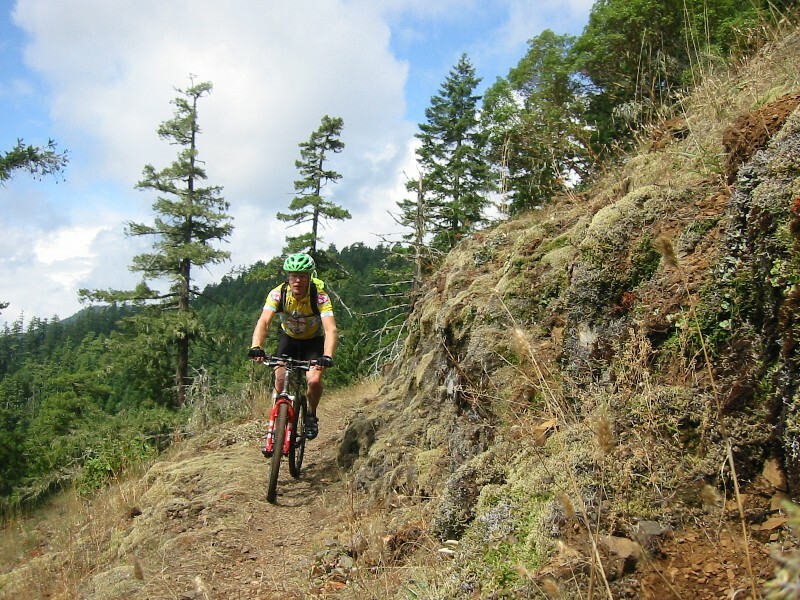 Numerous mountain bikers out on this Friday morning, and Cathy was the only hiker. A group of five took off just before I did. One snapped a chain not 200 feet into the woods. I passed them, but soon after one of the more racer looking guys passed me when I dabbed in a loose section. I stayed on his wheel almost the whole way up at a very hard pace. He eventually stopped and we talked for a bit. They were doing a big loop that took the Smith Creek trail back down. I thought about this on my first visit to the volcano, but it is a very long ride, more than I had time for. Maybe on our next visit to the NW. I took a few more photos on this ride, but mostly I just wanted to ride it uninterrupted. The Ape Canyon/Loowit/Truman/Windy Ridge ride quite possibly makes my top three rides ever list. I have to think hard which top three ride to push off the list: Porcupine Rim trail in Moab, UT? 50-year Trail in Tucson, AZ? Pratt-Gridley loop in Ojai, CA? The riding just doesn’t get any better than this. 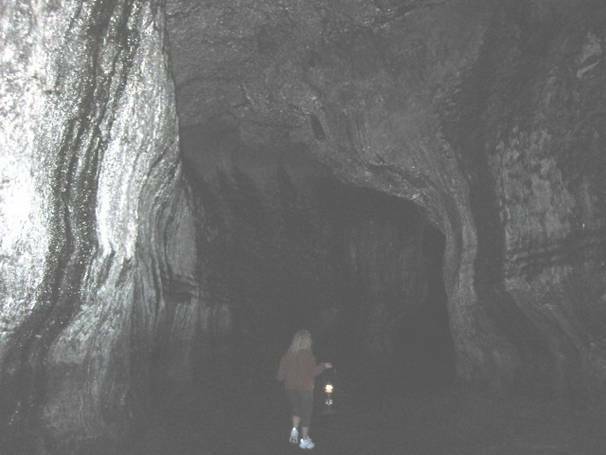 Entrance to Ape Cave lava tube at the base of Mt Saint Helens. Most of the pictures I shot in Ape Cave were completely black. This one barely shows Cathy with lantern after significant brightening. 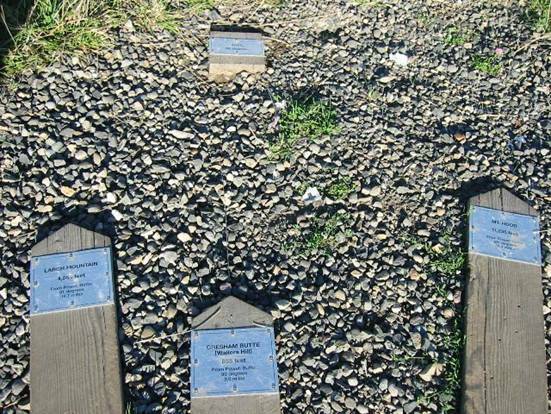 Artifacts from the 1980 eruption on Loowit Trail. 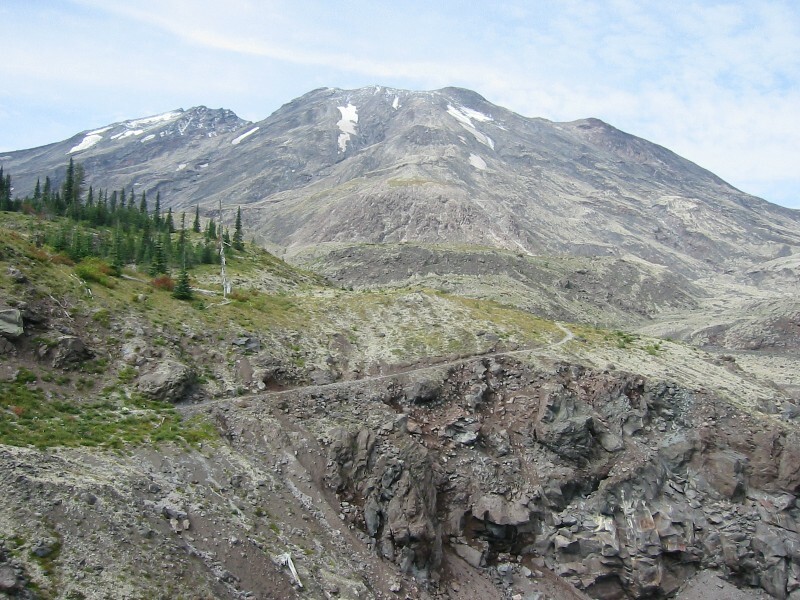 Mount Saint Helens east slope with Ape Canyon Trail in foreground. The scary no-fall zone is in center of image. I work up the nerve to ride it in both directions this time. Just had to look ahead, not at the 300 foot drop. Self portrait on Windy Ridge. We still had a couple hours daylight left before we had to pack our bags for the trip home the next morning. We decided to do a short, “easy” hike that was close by. The trail called Angels Rest fit the bill nicely. We drive over, only 15 minutes from hotel, and begin hike with no water or food. The trail was wide and smooth for the most part, but very gnarly in a few spots, especially near the overlook up top. Not having enough to eat since my hard St. Helens ride, I bonked horribly half way up. Almost bagged the rest of the climb. We slowed way down and eventually reached the top, but we were both soaked in sweat. The view from up top, 1600 feet above the river, was spectacular. Well worth the hike. 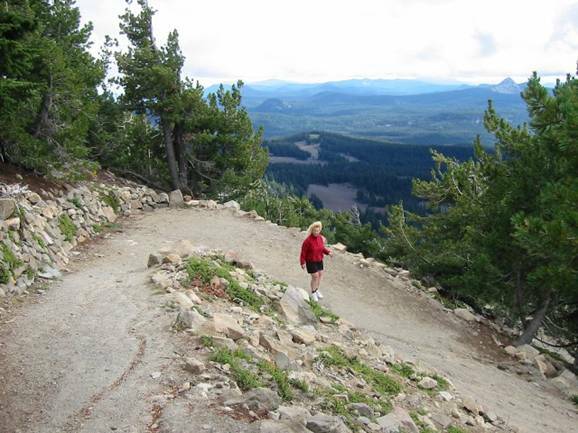 Cathy approaching the summit of Angels Rest lookout. Most of trail was smooth, easy hiking, unlike what is shown here. Last picture of the trip. Set camera on rock and did the 10 second thing as nobody else was up here. 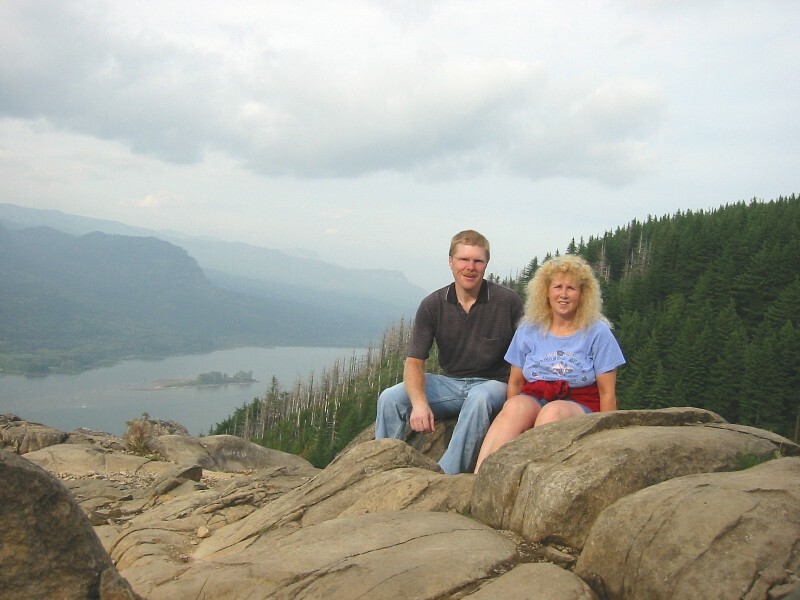 The Angels Rest vista provided fantastic views both east and west of the Columbia River Gorge from 1600 feet. This trip was my best to date. A pure vacation, not a few days added to a business trip deal. 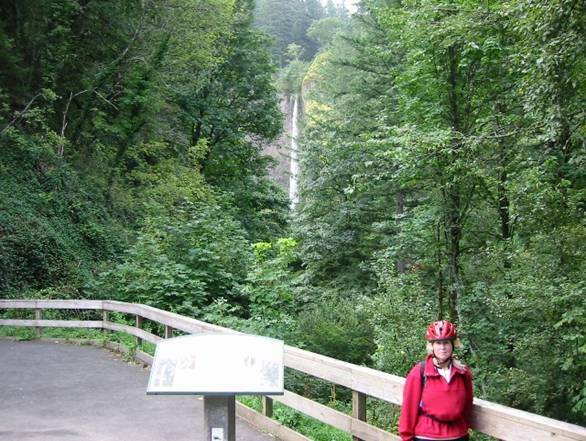 Plus Cathy was along, unlike most business trips, and she enjoyed the shopping, cycling, and hiking. We couldn’t have asked for better weather from the typically rainy NW – dry and just right temps. It rained 5 days straight just before we arrived. We got to see everything we wanted. I biked and hiked a combined 300 miles in 7 ½ days. I was impressed enough that we’ll have to come back again, maybe take on one of the very challenging volcano summit hikes and visit Mt Rainier in central Washington as well. Compiled by Doug Jansen, September 6, 2004.